Spring beauty is all about a dewy, soft, fresh-faced glow. Which obvi, starts with skincare! 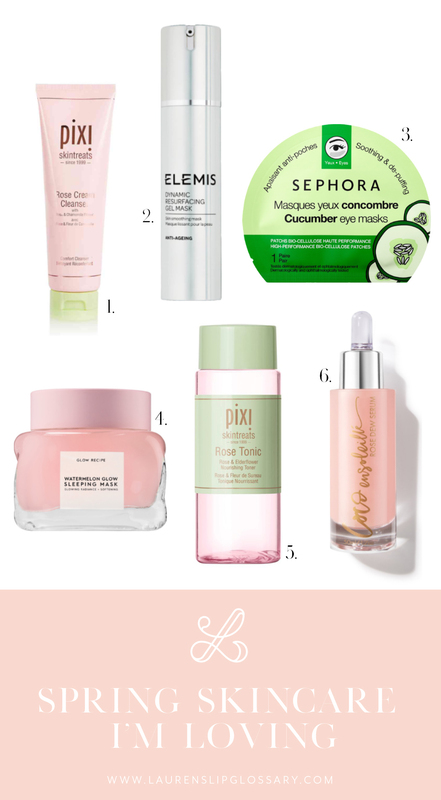 These are a few spring-inspired skincare products I’ve been loving. There are a couple of fruity situations which we love, fruits have amazing enzymes to help exfoliate the skin. And obvi, we have a few rose products which are super soothing. Pixi Rose Cream Cleanser – This is so gentle and is a great choice for all skin types. It’s got aloe vera, avocado, and chamomile so it’s ultra calming. Elemis Dynamic Resurfacing Mask – I love that this has a cooling, tingling sensation that feels so good. Plus it gets rid of all the dead cells leaving the skin silky AF. Sephora Cucumber Eye Masks – These help SO much with depuffing and are hydrating AF so concealer goes on so much better. Glow Recipe Watermelon Mask – Okay firstly, it smells SO f-ing good! But this is an overnight mask that leaves my skin so radiant and dewy after I rinse it off in the AM. Pixi Rose Tonic – This toner is super soothing and has been a staple in my skincare routine. Coco Ensoleille Rose Dew Serum – I’m totally obsessed with all things Coco Ensoleille! This serum makes my skin so firm, plump, and dewy.